Congratulations to David Peters, Winner of the EPT Malta High Roller (€597,000)! Three long days of high-stakes tournament poker action culminated following an epic heads-up battle between David Peters and Ivan Luca for the trophy, the coveted SLYDE watch, and a €597,000 first-place prize. 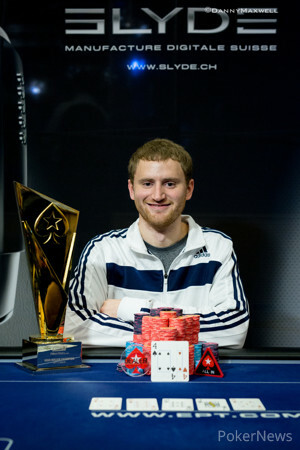 In the end it was Peters, the American pro, who took the event down for the biggest score of his live poker career. The final day of the event started with 18 players, all of which were guaranteed €32,300. Sam Greenwood was the first player to collect that amount when his ace-ten fell to Viacheslav Goryachev's ace-jack. Shortly after that, former EPT Grand Final champion Steve O'Dwyer got knocked out when his pocket tens fell to Daniel Ghionoiu's ace-king. The field was then down to two tables of eight, and the final table came in sight after Sardor Gaziev, Davidi Kitai, Simon Higgins, and Ludovic Geilich were eliminated in a short span. Ghionoiu was knocked out in 12th by Artem Metalidi when his ace-jack got no help against ace-queen, and moments later Mike McDonald hit the rail in 11th place for €52,100. With 10 players remaining, five on each table, it was Luca who held the chip lead over Metalidi. Nicola D'Anselmo was the short stack with 18 big blinds, but it was Marc Etienne McLaughlin who busted out on the final table bubble. McLaughlin lost a flip with ace-four against Goryachev's deuces and the final table was set. Nick Petranglo, who finished fourth earlier in the €25,500 High Roller, became a strong force at the final table and held the chip lead for quite some time. After D'Anselmo (9th - €62,200) got knocked out and Sylvain Loosli hit the rail (8th - €75,000), it seemed like Luca and Petrangelo would battle it out for all the money. This trend continued when Luca busted Ukrainian Igor Yaroshevskyy in seventh place (€102,000) with ace-five versus ten-nine. The only player that really had a short at putting a stop at Luca and Petrangelo's dominance was Peters, who played back at the two bullies on occasion. On the last hand before the dinner break, Peters tried making a stand again, but his four-bet shove almost ended in disaster when Petrangelo called with pocket queens. Peters showed two tens, but a ten on the flop gave him a surprising chip lead with six players left. Soon after the dinner break, Petrangelo busted in sixth (€139,000), followed by Charles Carrel in fifth (€183,800). After the tournament got down to four players, the action slowed down considerably. Peters and Luca played most of the hands, while Metalidi and Goryachev patiently waited for good spots. In the end it was Metalidi who busted in fourth place for €234,500 when he shoved six-seven off suit into Goryachev's ace-eight of clubs. 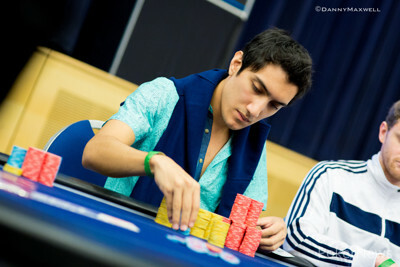 For just a few hands, Luca became the short stack, as Goryachev chipped up to 3.5 million versus Luca's 3.4 million. But Peters put an end to that trend. Goryachev got his money in good with a pair of eights on a six-seven-three flop versus Peters' jack-seven, but the river brought another seven to give Peters a big lead going into heads-up play. Goryachev cashed for €290,500, and the final two players were guaranteed at least €397,000. After talking about a deal for close to 30 minutes, neither player gave in to the other's requests and play continued with €200,000 on the line. Peters started with 10.6 million versus Luca's 4.55 million, and he never looked back. On the final hand, Luca shoved from the button for 2.62 million and Peters called with pocket fours. His small pocket pair held up against ace-eight and Peters celebrated with his friends Shannon Shorr and Jonathan Little, who were intensely following the action from the rail. Here is the final payout from the final table of this event. On the last hand of the tournament Ivan Luca moved all in from the button for 2,620,000 and David Peters called from the big blind. The board ran out and Luca was knocked out in second place. Peters took down the tournament and he will walk away €597,000 richer! David Peters raised the button for 340,000 and Ivan Luca three-bet to 675,000. Peters contemplated his next move, and ultimately decided on calling. Luca checked on and Peters bet 520,000. Luca made the call. The on the turn was checked by both players and so they saw the on the river for free. Luca bet out 675,000 and after a minute of thinking, Peters shoved all in. Luca checked his cards one more time and folded. Ivan Luca raised from the button to 260,000 and David Peters called from the big blind. The flop came down and Peters check-called 310,000. On the river the hit and Peters lead for 730,000. Luca tanked for several minutes and ultimately he folded. Both players have limped numerous buttons so far. Just now we saw Peters limp in and call Luca's raise to 310,000. The flop came and Luca bet 305,000, Peters called. Both players checked the turn and the hit the river. Luca bet 505,000 and Peters folded almost instantly. After a lengthy discussion a deal has not been agreed upon. The cards are back in the air with 22 minutes left in the current level, and we're playing for it all! There is a difference of €200,000 between first and second place. A deal has not been made yet, but in case an ICM deal would be agreed upon, here are the numbers. The players are currently on a break and we will keep you posted on what the outcome of the negotiations will be. The two players requested a short break before the heads up starts. David Peters will start with a more than two to one chip lead; 88 big blinds to 38 big blinds.